The Rabbi of Greece handled all our food issues, he sent a box of food with instructions for how to warm the meals up. It was truly a special time there. Shabbat was spent back in Athens, and what can I say, while the food at the Athens kosher restaurant – Gostigo, was very solid indeed, the wine options there are NILL. We had a bottle of Barbera de Alba, which was painful, but there was plenty of good beer and food. Athens has some lovely sights, especially the ancient sites of the Acropolis, a hilltop citadel topped with ancient buildings such as the colonnaded Parthenon temple. Still, as much as it was lovely, Santorini crushes it! Santorini is an island of white homes clinging to sides of mountain sides, with a wonderful history of agriculture and wineries! When I posted my trip to Facebook, friends asked if I visited any of the wineries there, I sad there were no kosher ones, so no! After Greece, we made our way to Barcelona – which is a three hour train ride from both Elvi Winery and Capcanes Winery. We were limited for time, and Barcelona’s mad architects were calling; so we accepted the kind hospitality of Moises Cohen; owner and winemaker of Elvi Wines. We tasted through all the wines and really enjoyed all of them! There are a few new ones and many of the old names as well coming to the US soon. 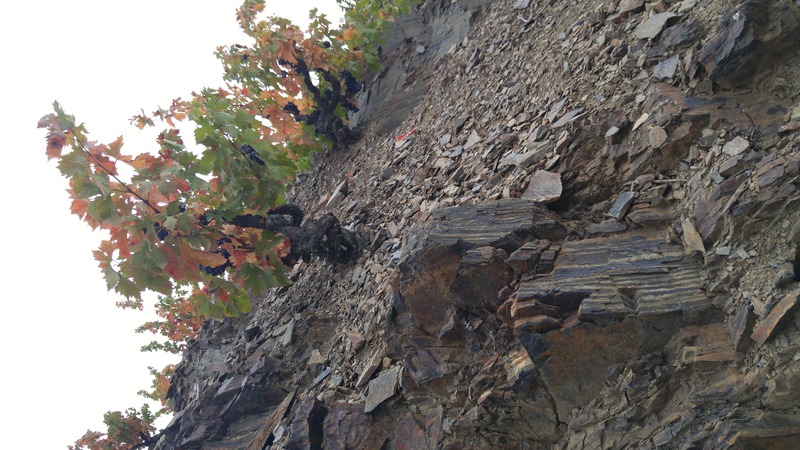 The next day, Moises took us to see the cliff clinging vines of Priorat buried in Licorella – insane!! Just trying to walk up the mountain side where the vines are planted – was putting my life in danger, crazy inclines! The fruit are used in Elvi’s EL 26 red wine – all dry farmed and not trellised or terraced, insane! From there we made our way to Barcelona – sadly our time in Barcelona was met with overcast skies, so the colors of Gaudi did not pop as much as we had hoped, but the man’s work was still insane! Here was a man whose life was cut far too short, a man with a vision that only he could see and understand, but a man whose life lives on through the eyes of beholders throughout Barcelona. The street of discord, the MNAC, and Parc Guell, and so much more pulled us in different directions in Barcelona, and we truly did not give it the time it deserved. I am to blame for that, I wanted to spend some time with Moises, and I am not sorry for that in anyway. All it means is that we need to go back and next time spend sometime with Moises up in the Rioja wine region! The kosher food scene in Barcelona was excellent, the restaurant we ate at every night is called; Maccabi and we really enjoyed the tapas and apps. From there we made our way to Madrid to take in as much art within half a day that two humans could take! In the end, we made it to two museums; the reina sofia museum and a hall where they were showing a large chunk of Wassily Kandinsky art that essentially sits fallow in the underground caverns of the Pompidou museum in Paris. Turns out that Wassily’s wife donated the art that kandinsky himself kept – defining his careers arcs and ebbs – to the Pompidou art museum in paris. Sadly, just as he was under appreciated while alive, the Pompidou continues this bigotry and European art chauvinism – by locking away these priceless paintings in the catacombs of its very hatred. What can I say, I have been a HUGE fan of this man since we first laid eyes on his work, and it is always a great day when I get to see his work. Well, when one of his paintings alone, touches my soul and makes a trip to pompidou a must-do when visiting paris (along with Musee de l”orangerie to see the 360 degrees of lili pads), when we fell into this art opening (which had been open for no more than a week when we walked-in into it), we literally broke out in smile that took a week to wipe off. The man’s work is stunning, but it was his work in France that takes my breath away. Please do read this piece by the art story, it describes his life and progression in his trade very well. Pictures of the art were not allowed – so what I took was only the posters they hung outside. From there we made our way to Gibraltar, via Malaga and then a long taxi drive – and while the rock was nice, the location to me was truly special for the Jewish aspects. The “country” is an area of less than 3 square miles, it can be walked on a Shabbos from end to end, and it is one of the safest places to walk in all of Europe! We met many people there, who moved to its enclosed walls for its safety, and I am not talking about Jews. Though, no matter where you walk in Gibraltar you will find Jews of all sorts. There are many synagogues and kosher restaurants and bakeries. It was a true joy and a place I would visit again, especially if you want to take a quick jaunt to Morocco! Thankfully, the stores stay open late there, as Shabbos starts late there – because of its southern position on the map. We arrived at noon and by 4PM we had all the food, wine, and nosh that we could use over a shabbos! Thankfully, one of the stores had Elvi wines – so I was set! We bought everything we needed from Deli Express, and it is a great place to buy wines and it is far cheaper than the other places. The bakery was where we got our challah – so then we were set. We walked up the mountain on Sunday and again it was overcast day, so most of the pics are dull – but hey such is life. Another fascinating fact about Gibraltar – the runway (for most flights) goes across the main road of the “country”. We stayed at the Sunborn hotel, which is a boat that is berthed alongside the marina which is alongside the runway. So we could see planes landing all shabbos from our hotel room. Because the runway goes across a public road, and the runway itself is open to the public a truck does a visual inspection before a plane takes off or lands on the runway. I was successful at taking a picture of a plane taking off from the main road runway. From there we flew to Glasgow for the 2015 World Gymnastic Championships. The city was old and dull to me, but there is a lovely pedestrian walk less than two blocks from where we stayed over the week and it was filled with nice art museums and great shops! The Kelvingrove art museum is a must see, and it did not disappoint! While the majesty and grace of gymnastics filled our week, there was little in the way of kosher wine in Glasgow. Now, there is a lovely food shop and restaurant, in the Jewish section of Glasgow; Giffnock, called Mark’s Deli – the kosher wine selection – left much to be desired. I decided in the end, to get grape juice and suffice upon beer once more! We got all the food and challah we needed at mark’s deli – so we were set for a lovely shabbos in Giffnock. The shul is massive and old, and the people inside it are very warm and hospitable, and we really enjoyed our time there. Now, the saddest wine of my trip was the huge letdown I had when I finally got my hands on a bottle of Recanati’s Carignan and Petite Sirah wine blend. You see Marks and Spencer had Recanati Wines make them a special blend – just for them – of Carignan and Petite Sirah. Sadly, after all is said and done – this Recanati wine is not a wine I would buy again. The Carignan shows beautifully, richly expressive and layered, but the PS is far too sweet and over-toned in ways that are not balanced or enjoyable. I bought a bottle for my last day in Glasgow, we found it while walking the pedestrian walk and while the folks there are nice, I wish I could say the same for the wine. Well there you are! I am back and I will be posting more about the wines I tasted at Elvi Winery. In the mean time, the wine notes and pics are from the time we had in Europe – enjoy! The nose on this wine screams from cherry, raspberry, along with heaps of dirt, and coffee. The mouth on this medium bodied wine is rich with layers of dark red fruit, nice firm tannin, and good balancing acid. The finish is long and acidic with currant, coffee, herb, and dark fruit lingering. This wine has improved with time and age, and being that is it NOT mevushal, that makes it lovely! The nose on this bubbly and effervescent light pink colored wine, is hopping with strawberry, lemon friache, lemongrass, lemon, and cherry. The mouth on this medium bodied wine is packed with small bubbles that are active and alive, they mingle well with the strawberry, dried currant, intense acid, mouth drying fruit structure, and a lovely hit of quince candy. The finish is long with more core acidity, strawberry, bubbles, a hint of pith and lemon rind – BRAVO!!! The nose on this dark garnet to black colored wine is rich and oaky with chocolate, dark cherry, rich mineral, lovely sweet dill, and rich loamy dirt. The mouth on this medium bodied wine is rich, expressive, mouth coating, and lightly extracted with good concentration of dark plum, blackberry, raspberry, and cranberry, sweet cedar, with good mouth coating tannin to bring the whole thing together. The finish is long and balanced with good acidity, rich espresso coffee, more dill, and earthy goodness. This is a lovely wine that has many years ahead of it, the layers of dark fruit, tannin, lovely fruit structure, and solid acid, make for a wine that can handle most any fruit. Add the low price to this and this is a no brainer QPR winner. I had high hopes for this wine, but sadly the wine is far too sweet for me. The carignan is awesome, but the Petite Sirah turns it far too sweet for me. Those that like the normal Recanati Petite Sirah will love this wine. The nose on this wine is the clear winner, with an intoxicating brew of dark berries, freshly squeezed blueberry juice, intense cedar, dark dark fruit – bordering on date, heavy vanilla, and root beer. The mouth on this medium bodied wine shows nice extraction, classic Israeli notes, of dark overripe fruit, date, dill, rich sweet tannin, blackberry jam, boysenberry, red currants, rich loamy earth, and smoking tobacco. The finish is long and intensely sweet, showing cloves, cinnamon, and more sweet notes, on a very fruit forward and date riddled finish. Posted on November 13, 2015, in Kosher Red Wine, Kosher Sparkling Wine, Wine and tagged Adar, Carignan/Petite Sirah, Cava, Elviwines, Herenza Crianza, Marks and Spenser, Recanati Winery. Bookmark the permalink. 2 Comments. I know that you only comment on wine but, surely, a visit to Scotland allows you a little latitude to write about Scotland’s best known exports. Totally agree! Sadly, we were there for the gymnastics meet and then left the next day – so that left no time to go to distilleries. We were there ten+ years ago and at that time I visited Oban.